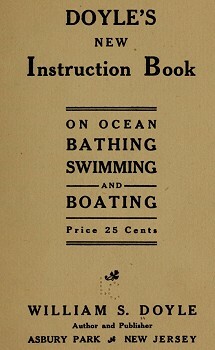 Doyle's New Instruction Book on Ocean Bathing, 1910. Doyle's New Instruction Book on Ocean Bathing. W. S. Doyle, Asbury Park, N.J., 1910. Very basic instructions for surf-bathing by author, and sometime poet, William S.:Doyle. And there on the beach the swimming art to teach. Doyle was always found near to give them good cheer. And when Doyle was near there was no need of fear. Doyle always managed to be Johnny on the spot. The people they cheered him by the score. He was never known to have a life line. There never were found to be any one drowned. But there is proof that they are all genuine. It must be proved that you are a brave man. But Doyle's life-saving record is second to none. Buy Doyle's' new book, it's right up to the minute. There are no out-of-door games or exercise that can compare with ocean bathing and swimming for health and pleasure. It builds up the body uniformly by bringing every muscle into action. Daily baths keep the body supple. The salt water is a tonic and keeps the body in a healthy and vigorous condition. It also aids digestion and creates a good appetite. You can always eat and sleep well after an ocean bath or swim. It is good for the old and young alike. afford the time to bathe and swim and don't take it, lose the best and healthiest sport in the world. First secure a bathing time table. When convenient always bathe at low tide or an hour or so before or after and when the ocean is in a normal condition. Then there will be no need of holding the ropes or any other assistance. You can go any depth you like without fear as there is no danger. There is always somebody nearby to help you out if in need. Throw away all fear and be as bold as you can. Watch and try to do all you see the other bathers do and if you have some friends who are good bathers take every chance you can to be with them. water so as to help balance and guide the body. When a wave reaches you at the same time give yourself a little spring, and if necessary work your feet up and down with a high stepping motion to keep the body up while the wave passes. If a high wave comes and you can't get over it, duck or dive through it. When a running broken wave comes no higher than your shoulders, stand firm and cut it sideways; have your feet spread and braced. Keep this up for a number of times until you learn the action of the water and waves. Then you can bathe at any time or condition of tide. Always take the wave sideways. Never let them strike you on the back or breast. If you run aground at the bow all hands go to the stern with the oars and push off or twist the boat around and work it off. Never stand at the bow and try to get the boat clear. Work only from the stern. If hard aground some may have to get out before you can get the boat off. In rough water, swells or waves, cross the bow first. Never let the waves catch the boat sideways. and wait until the danger is past. The ocean waves are so wild they run in with a roar. Is like a fly's simple notion, flying around a spider's web. And watch the waves rolling o'er. To swim in the brine. When you're down at the shore. Geoff Cater (2017) : William Doyle : Ocean Bathing Instruction Book, 1910.